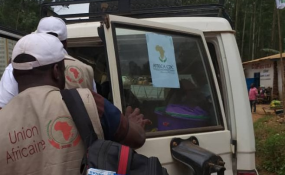 @AfricaCDC Ebola Experts were deployed to Butembo in DRC, 54km from the major trade hub of Beni. Community fear, attacks on health workers and armed groups are hampering a response to DRC's Ebola outbreak. A second wave of the outbreak has now developed in the eastern town of Beni near the border with Uganda. The epicenter of a deadly Ebola outbreak in eastern Democratic Republic of Congo has shifted due to a "toxic mix of factors," officials said Saturday. A new wave of the disease has developed in Beni, in North Kivu province, near the border with Uganda. The epidemic was previously in the smaller town of Mangina, about 20 kilometers (12 miles) to the west. "The epidemic in Beni is high risk... and the situation is worrying," Health Minister Dr Oly Ilunga said. The second wave of the outbreak has been fueled by community resistance to health measures, public misinformation and insecurity caused by a plethora of rebel groups in the area. Fear and mistrust in communities have led to problems responding to the Ebola outbreak. Residents in Beni have attacked health workers, including those coming in hazmat suits to properly dispose of infected bodies. Tracing those who have been in contact with infected persons has been one of the "greatest challenges," the World Health Organization (WHO) said in a situation update this week. Community reluctance and refusal to cooperate with health workers have led to lost contacts and follow-up, raising the chances of the virus spreading. "With each new violent incident in northeast DRC, the community loses further trust, protests and further violence limit our access, and more cases and contacts are lost to follow-up. This vicious cycle increases the risk of Ebola spreading," WHO's emergencies chief, Peter Salama, said in a Twitter post. He said Beni has become the epicenter of the outbreak due to a "toxic mix" of insecurity, community mistrust and fears and rumors about Ebola. Since July, there have been 130 deaths and 205 confirmed or probable cases of Ebola, according to WHO numbers. Around of three-quarters of the cases have been in Beni in the last month. About 15,000 people, including 6327 health and frontline workers, have been given an experimental Ebola vaccination. The Ebola outbreak may last for several months and there is a risk of it spreading to Rwanda and Uganda, according to WHO. "As the risk of national and regional spread is very high, it is important for neighboring provinces and countries to enhance surveillance and preparedness activities," WHO said in its latest update. Speaking ahead of the World Health Summit in Berlin on Saturday, German Chancellor Angela Merkel said the 2014 Ebola outbreak in West Africa highlighted the need for the development of a global warning system to prevent pandemics and epidemics.